The 2" field flattener for AIRY BLACK is specially designed for our AIRY BLACK apochromatic refractors and it generate a very large flat field, to use with cameras with big sensors, up to APS-C. In this way, the pictures will be perfect, with pinpoint stars up to the edge of the field! This flattener is directly screwed to the thread back on the focuser's tube of the telescope: in this way you avoid the unwanted flexures! In the camera side, it has a T2 thread for connection to DSLRs (it requires T2 ring) or cooled CCD cameras. 2" field flattener for AIRY BLACK is specially designed for our AIRY BLACK apochromatic refractors and it generate a very large flat field, to use with cameras with big sensors, up to APS-C. In this way, the pictures will be perfect, with pinpoint stars up to the edge of the field! 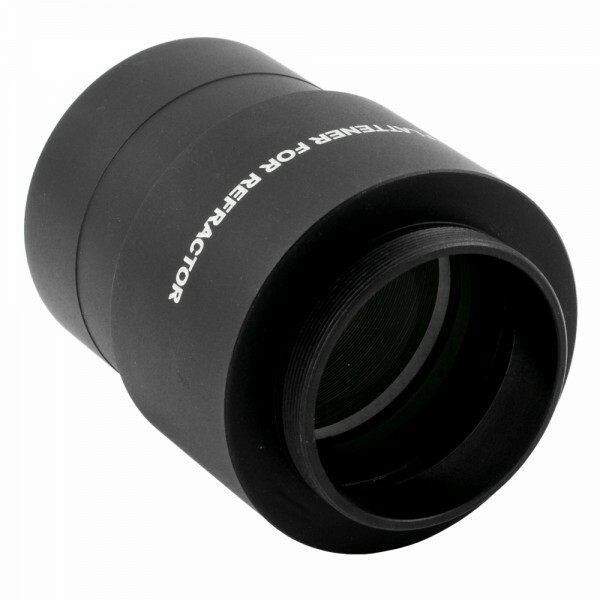 Please note, if you have a FULL FRAME camera, you would need our DELUXE 2.5" FIELD FLATTENER! Click here! Canon EOS 7D DSLR connected (with Canon EOS T2 ring) to 2" field flattener: everything is then connected into the AIRY BLACK focuser. This flattener is directly screwed to the thread back on the focuser's tube of the telescope: in this way you avoid the unwanted flexures! In the camera side, it has a T2 thread for connection to DSLRs (it requires T2 ring) or cooled CCD cameras. In order to obtain the best performances, you have to set sensor position at 55mm backfocus distance from rear field flattener thread (for a DSLR camera, you simply connect the DSLR camera body to the field flattener using the T2 adapter).